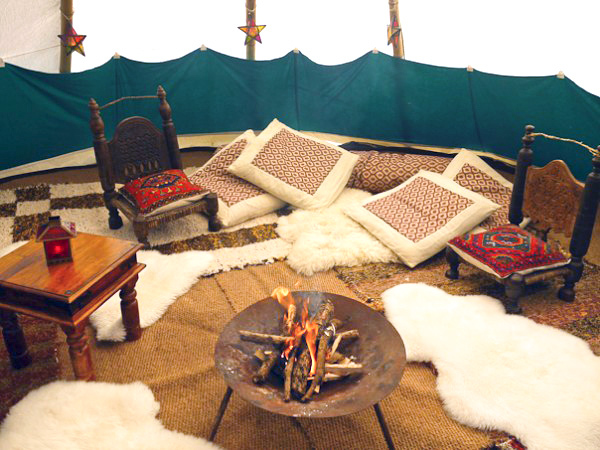 Staying cosy in a Tipi or Yurt in the UK generally requires a heat source. Tipis are designed to have an open fire in the centre whilst a Yurt works better with a Wood-stove. Yurts are the best for being warm all year round as they can have an extra layer of insulating felt. Hearthworks are a supplier of handmade pure wool felt yurt covers imported from Kyrgyzstan. These are complete yurt covers made from felt in the traditional way. Each cover is hemmed with horsehair edging and also includes handwoven decorative straps as part of the product. 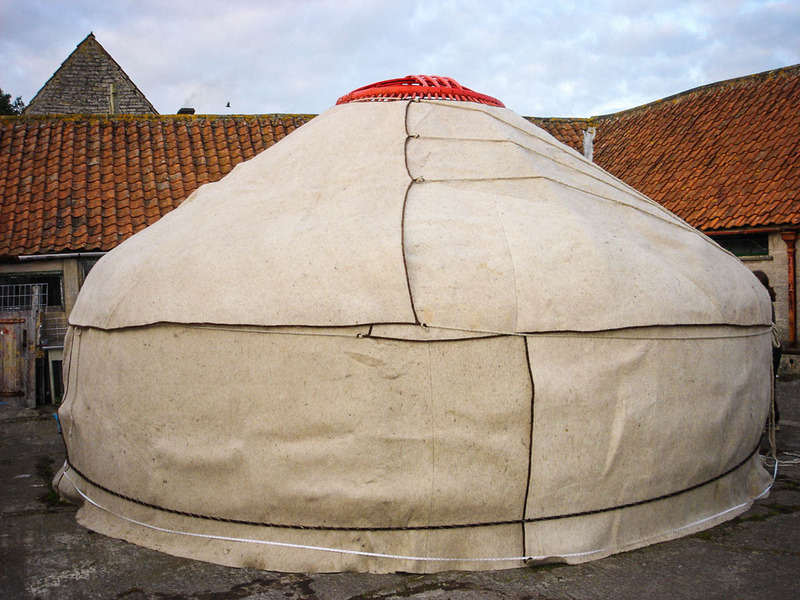 The roof sections are in two overlapping halves and are specifically designed to fit steam-bent Yurt frames. The Kyrgyz felt differs from machine made Mongolian or Western felt. Handmade Kyrgyz feltwork has a very dense composition, made of multiple layers of natural wool that gives it real strength and quality. Made in the traditional way, the collected and carefully graded wool is subjected to a lengthy process of cleaning, rolling and drying. The finished felt has an aesthetically pleasing light grey colour that doesn't shed fibres like its western counterparts, it can therefore be used without any inner liner. It has excellent natural fire retardancy and insulative qualities, keeping Yurts cool in summer and warm in winter. With our straight-roofed Pine Yurts we offer local machine-made recycled wool felt. This does also require an inner canvas cover on the Yurt as it does shed fibres. Many of our clients live in Yurts year round in the UK using this insulative layer complimented by a quality wood burning stove. We offer a range of professional wood-burning stoves from our chosen suppliers. Although generally Stoves are fitted in Yurts, we have also fitted Stoves in Tipis for a number of clients over the years. 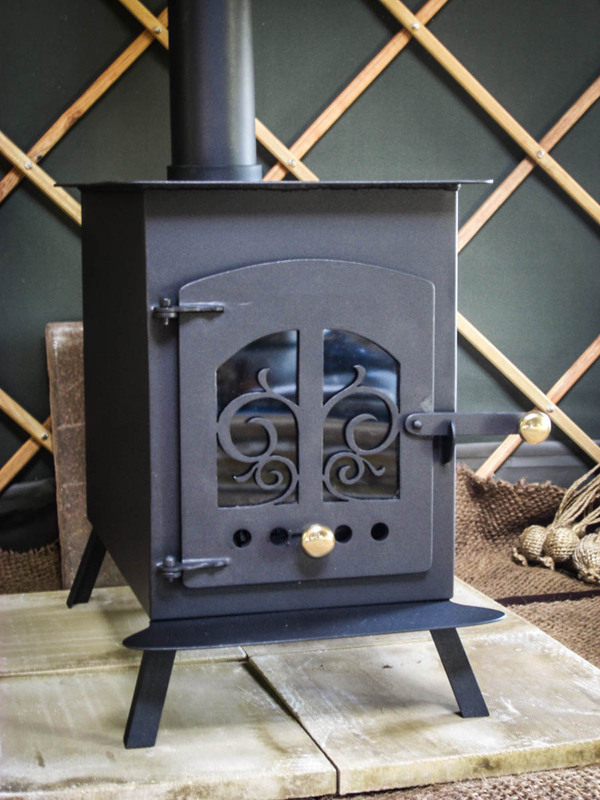 Our standard range of Stoves is manufactured by Smiffy of Snail Stoves, a talented local metalworker who has been manufacturing bespoke woodburning stoves for over fifteen years. Snail stoves are among the best we have come across in the UK in terms of performance, longevity and usability. A quality wood-burning stove is a lifetime investment, and these stoves are faultlessly individually produced. For an extra cost each stove can be finished with incredible bespoke laser cut design on the door. Snail Stoves come in three sizes, each suitable for different sizes of structure. We also offer CE certified Stoves from other suppliers, please enquire for details. For safety, our stoves are installed with a heatproof silicone flashing that's set into stainless steel plates to keep the flue stable and secure. We recommend the use of double-skinned flue from the point where the flue exits the Yurt through the flashing. This ensures there is no risk of the canvas near the flue ever overheating and burning, and helps the stove's functioning because it keeps the temperature within the external part of the flue more regular, so the stove draws better. The Firedish contains the open fire inside a steel dish raised up off the ground. The simple and highly practical Firedishes we use are suitable for use outside as well as inside our Tipis. They are handmade locally to an extremely high standard using quality steel and have detachable legs for ease of transportation. 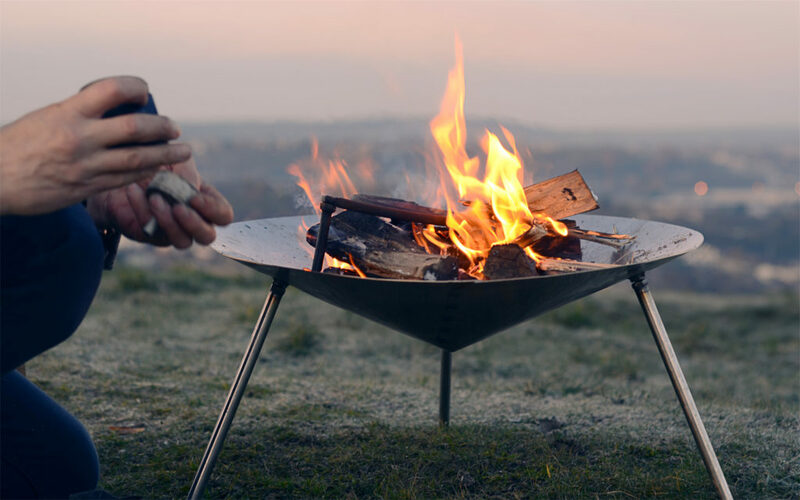 The Firedishes come in two sizes, a 20” size and 24” wide size recommended for our larger Tipis.